I’m going to get into the initial thoughts and first impressions, some of which I briefly talked about in the ZenPad S 8.0 Z580CA retail box post and photos. Some of this bares repeating, for good reason! If you’re considering the cheaper Z580C model, some of the details below will apply to that model also. Forgive the amateurish photos please! This is a rush job and it’s occurred to me that it’s time for me to get a new digital camera. When the Nexus 5 is getting clearer photos, I know there is something wrong. I’ll say this a few times I’m sure, but photos that you’ve seen online don’t do the ZenPad S 8.0 justice. This applies to both the $199 US and $299 US models. They have the same cosmetics and build, so this compliment goes to both tablets. It’s a beautiful piece of hardware. 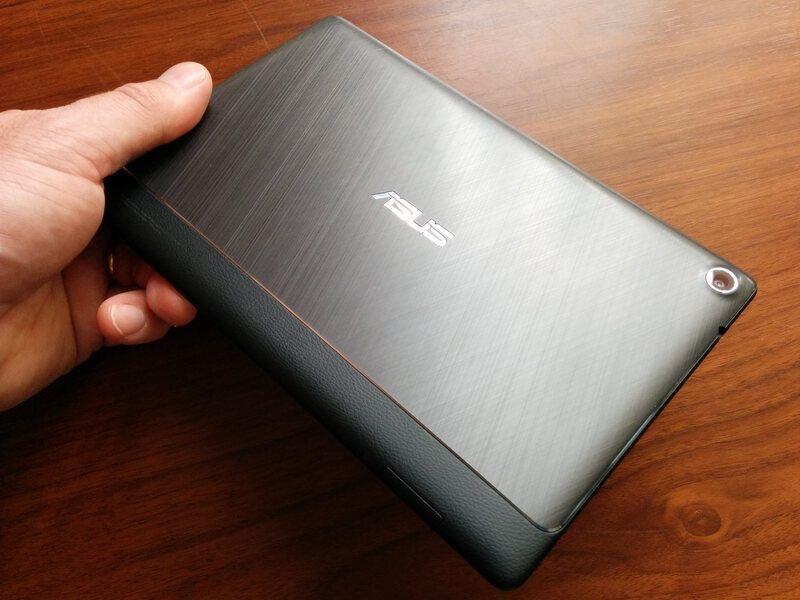 Not only is the ZenPad S visually stimulating, but the weight and thinness is equally astonishing. Perhaps you have had opportunities to hold the new iPad Air 2, iPad mini 4 or Samsung Galaxy S 2, in which case this will be par for the course. However, for most everyone else who is coming from a Nexus 7 or older tablet, or for anyone just getting their first tablet, this is a premium looking device. Is it built of aluminum? No. However, that should be a non issue. Your pocket book will thank you later! If you want aluminum and you want the latest and greatest hardware inside, be prepared to shell out big money. Asus created what they said they would. Luxury for everyone. 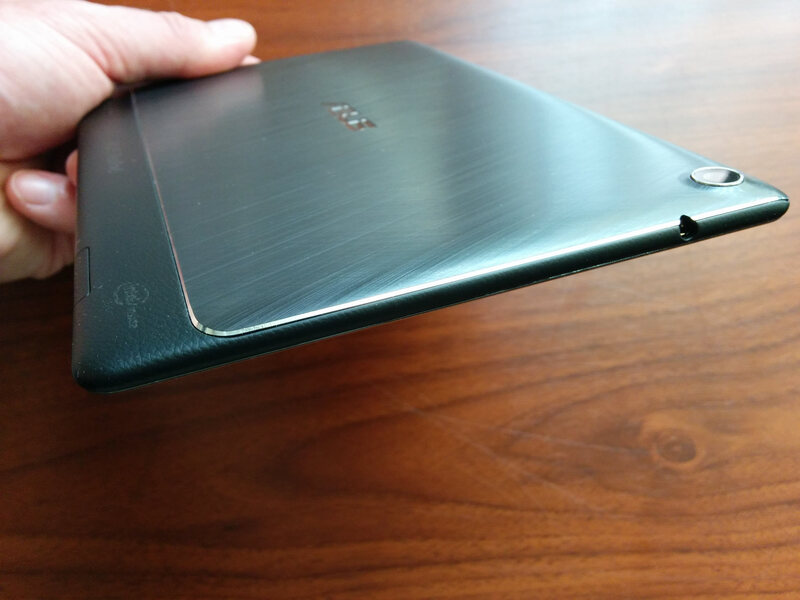 At $199 US or $299 US, this should be within reach for most people shopping for a new tablet. So the wow factor was immediate upon the unboxing. If you’re still a bit skeptical, then I suggest visiting a store and checking out the ZenPad S 8.0 for yourself. However, keep in mind that most retail locations have those pesky stretch cables attached to the tablet so you’re not going to fully appreciate the weight of lackthereof with the ZenPad S.
The chrome strip running along the back of the ZenPad S 8.0 is very easy on the eyes, and I can admit that normally the back of a tablet doesn’t “wow” me. Speaking of the rear, the ZenPad S 8.0 has a few, three actually, design features going on at the back of the tablet. The aforementioned chrome strip, the aluminum looking checkered pattern and then the unique leather like strip along one side. The leather looking strip is actually grippy which provides a better handling experience and less fear of the dreaded slippage out of hand onto floor situation. So the two photos above show the various textures and designs of the rear. Depending on your viewing angle, the chrome strip is noticeable (gleams) or it can be all but invisible. You can see the strip of rubberish leather texture in the one photo. There is/was an Intel logo and the ZenPad logo along the strip, but after brief usage those have all but rubbed off. Shh, don’t tell Intel their logo rubs off easily! The USB C charging cable has a more rugged feel to it than what you get with typical micro USB charging cables. It’s a bit more heavy duty feeling in terms of thickness, the cable that is. Manuals and documentation? Laughable really but this is the way products ship these days. 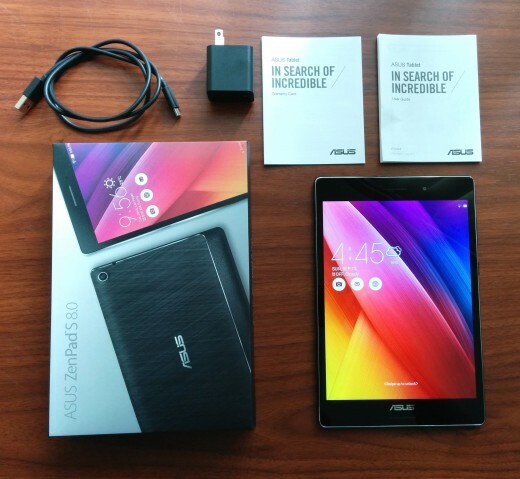 You’re going to want the pdf download file from Asus.com should you pick up this tablet. In fact the User Manual pdf file may exist on the tablet somewhere, but that’s for another day. When powering up for the first time, I had to find the power button which is placed toward the middle side of the tablet, right beside the volume buttons. I think it’s safe to say it’s a neutral location which will result in fewer power offs by accident. I don’t want to dive too much into the experience, as I’ll save details for the full review. So far, so good in terms of initial thoughts. It feels really good in hands and looks beautiful.